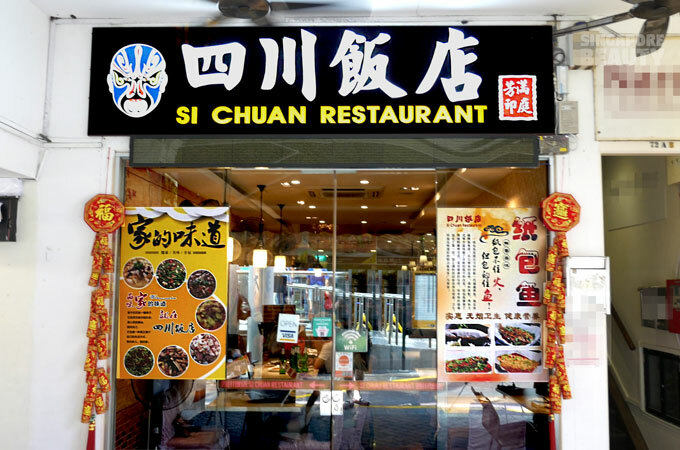 Located next to Chinatown MRT Exit A, Sichuan Restaurant ( 四川饭店) is serving authentic Sichuan Zi Char food fiesta ala carte buffet starting from $25.80++ for tourists and locals by reservations only. 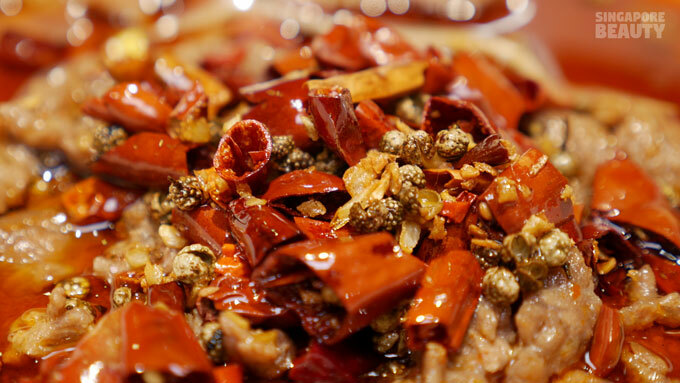 There are 80 Sichuan Zi Char dishes on the menu to choose from. 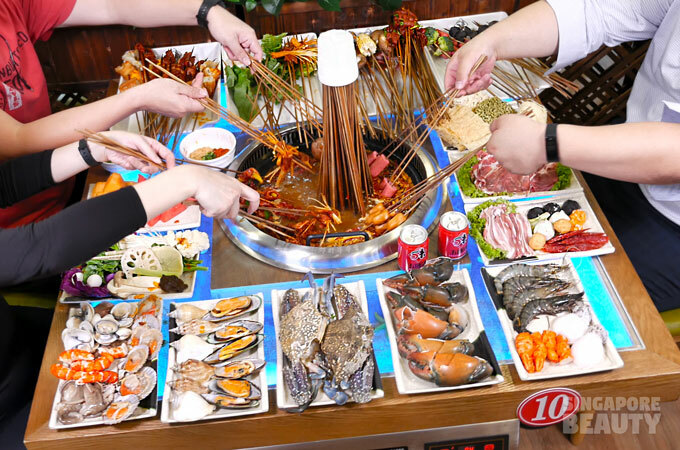 Chicken, pork, fish, beef, lamb, duck, frogs, prawns, vegetables and rice in Sichuan style. 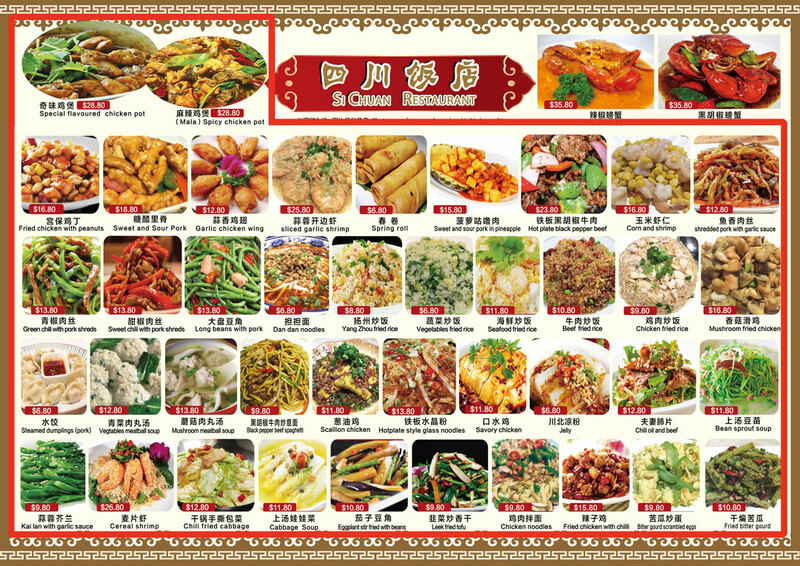 Those within the red boxes in the 2 page menu are included in buffet. Crabs and baby lobsters are excluded from this buffet. 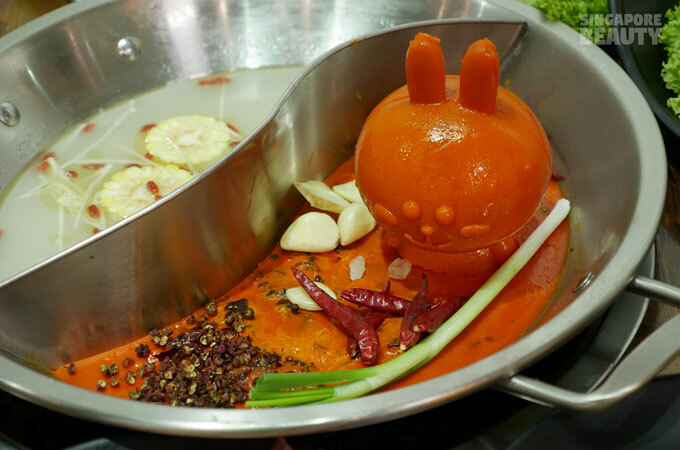 Mala spicy chicken pot – The whole chicken is poached in simmering water and heat is turn off when the boiling point is reached. The chicken continues to cook with the trapped heat. 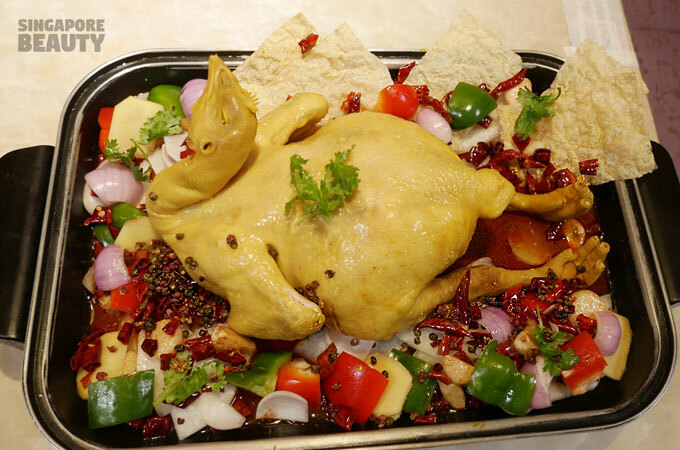 The result is a juicy and tender chicken. 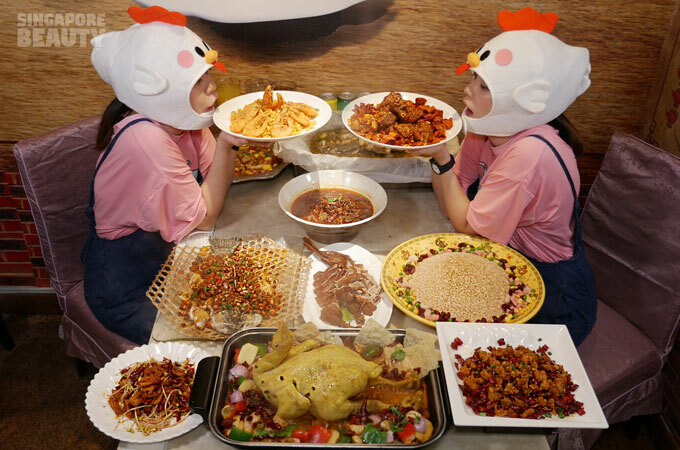 The chef will chop the chicken into bite size portions to prepare for the Mala spicy chicken pot. 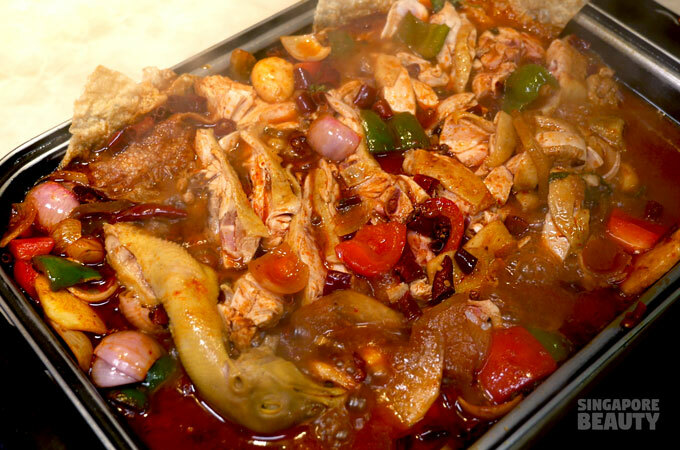 Chicken is served in a simmering hot pan with Mala gravy. 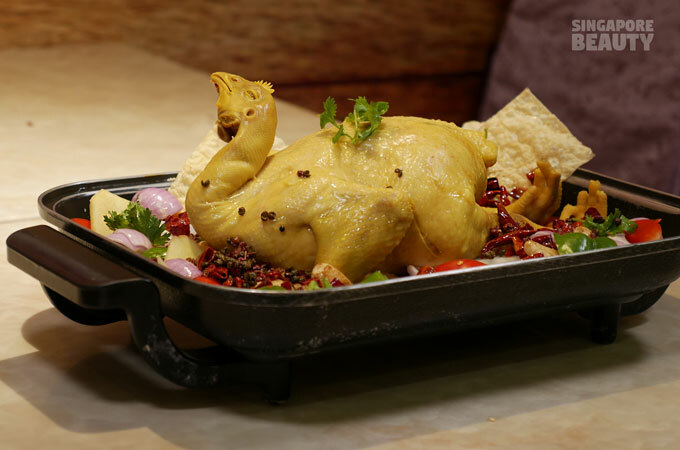 Eat the chicken with the spicy mala gravy littered with pepper corns, crunchy bell pepper and crispy bean curd skin. You can feel the tingling sensation along your lips after the first few mouths. 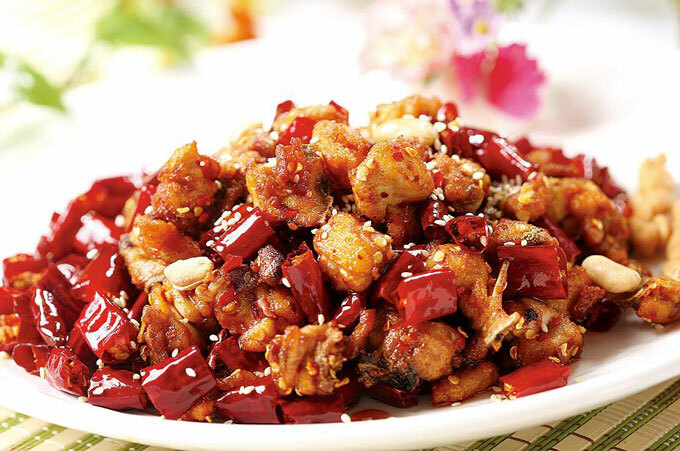 Fried Chicken with Chilli – Tender juicy bite size chicken with a light saline crust and a hint of heat from the bird eye chilli seeds. 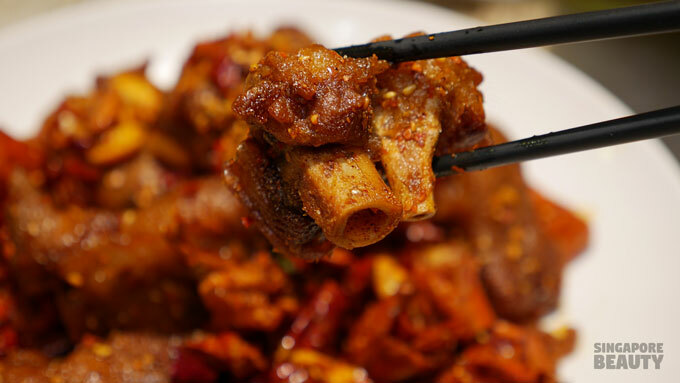 Spicy pork trotters – Deep fried pork trotters with a gelatine texture. 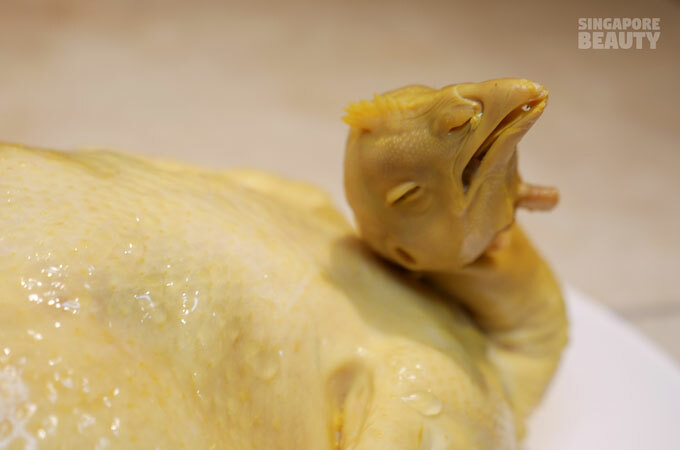 It has soft and gooey bits of cartilage similar to that found in chicken feet. The skin has a slight enjoyable elasticity to it that is not rubbery. Eat these with the ground nuts for a nutty butter like coat contrast. 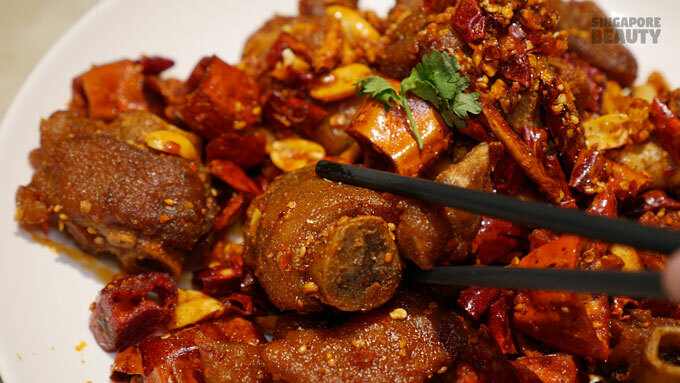 This dish is more on the savoury end than spicy spectrum despite it being named Spicy pork trotter. 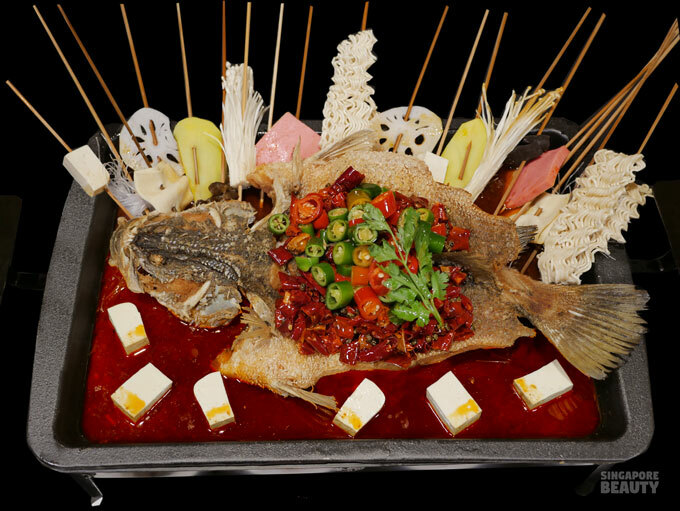 Signature grilled fish – Fish is fried to a light golden hue with crispy skin. Flesh is tender and comes off easily as chunk of silky bites. 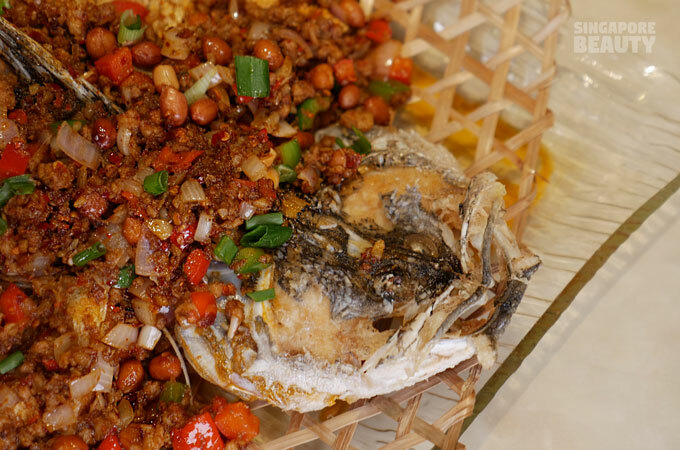 Topped with bites of chewy minced meat, aromatic ground nuts, sweet caramelised onions in grounded bean and garlic paste. 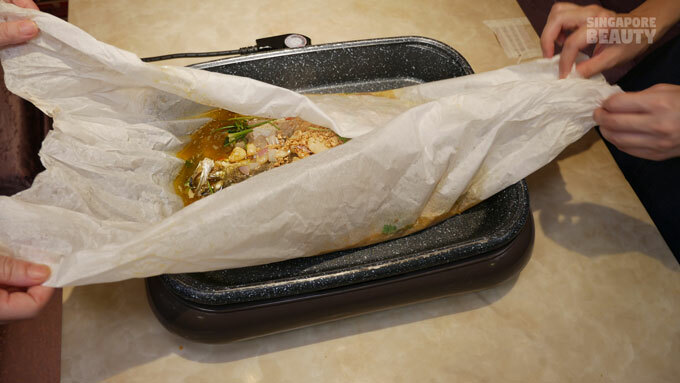 Fish (Boiled) in paper bag- A whole fish simmered slowly in baking paper with load of sautéed garlic cloves, chopped garlic and chilli pepper. 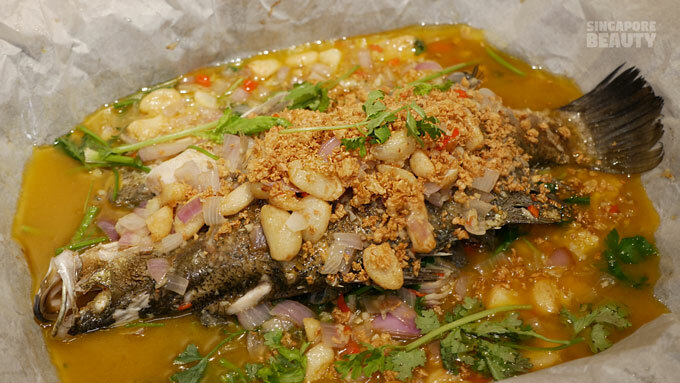 Fish with a gelatine skin with chunks of flaky flesh simmering away in hot gravy of chilli and fragrant garlic oil. 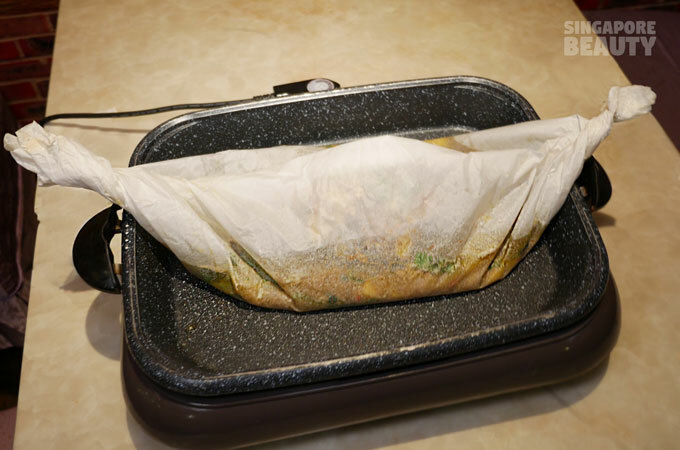 Using only the simplest ingredients – chilli and garlic oil – to bring out the natural sweet flavour of this fish. 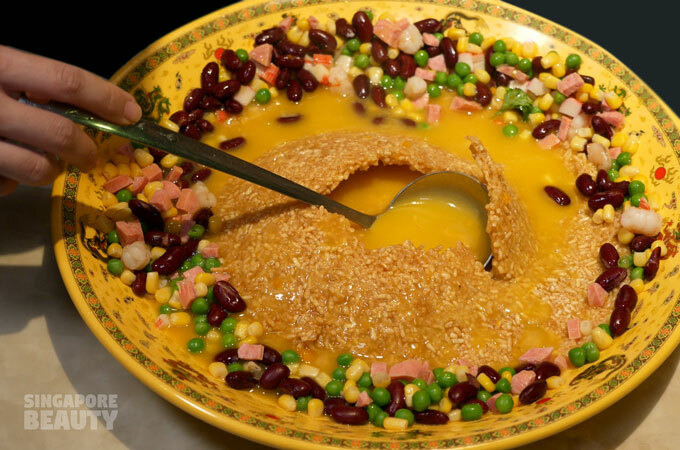 Rice crisped Dome in bean soup (Fried rice in bean soup) – rice crisped dome are made fresh in the wok for each order. This is how you go about enjoying this dish. The rice dome will be served piping hot from the pan. A bowl of homemade bean soup will be served with this dome. Drizzle this steaming hot soup over the rice crisp dome. 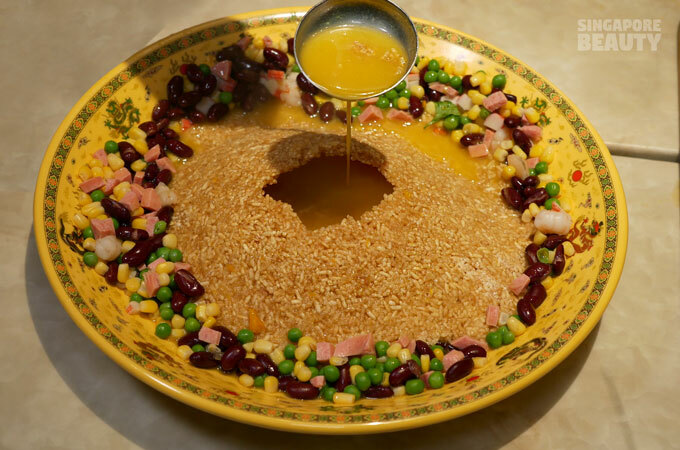 The rice dome will sizzle and collapse to reveal a crater like a volcano. You may now break the rest of the rice dome with the soup spoon. 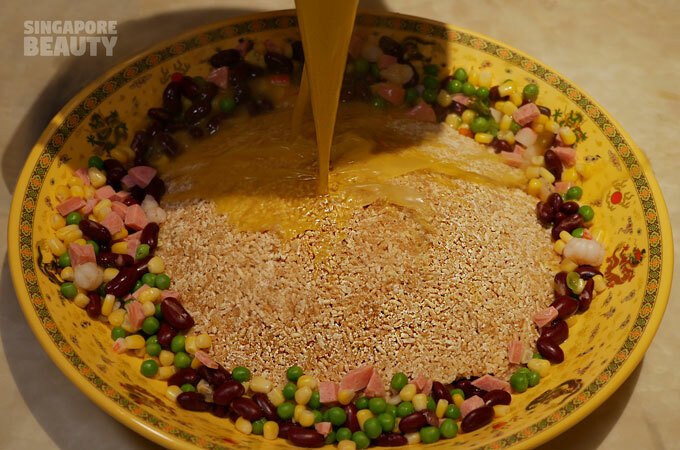 Enjoy the bean soup with the colourful assortments of beans and chicken sausage with the rice crisps. It tastes like corn soup with soft beans and popping rice crackers. 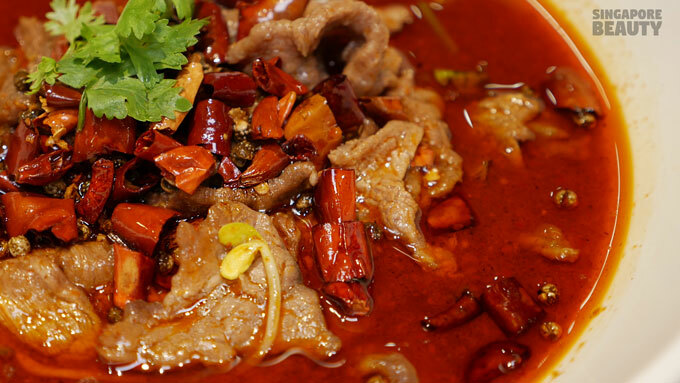 Sliced beef in hot chilli oil – Tender slices of curly beef in hot chilli oil with a strong aroma of spices. The amount of chilli, pepper corn and chilli oil is intimidating at the first look, but surprisingly pleasant on the taste buds. Sliced beef of chewy texture coated with thin layer of fragrant oil. They slide down your throat effortlessly . 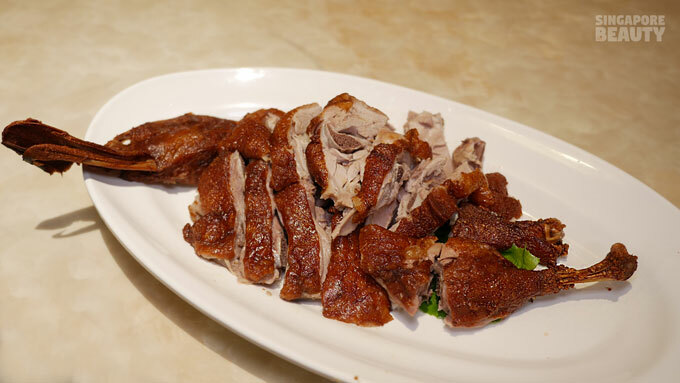 Malt-glazed duck – Preparation of duck takes up to 12 hours according to the chef. The duck is massaged and soaked in brine. Grounded spices are rubbed on the duck skin and the internal of the duck is stuffed with some other ingredients and left to sit for the marinade to set in. Followed by some other steps to get the duck ready for cooking. 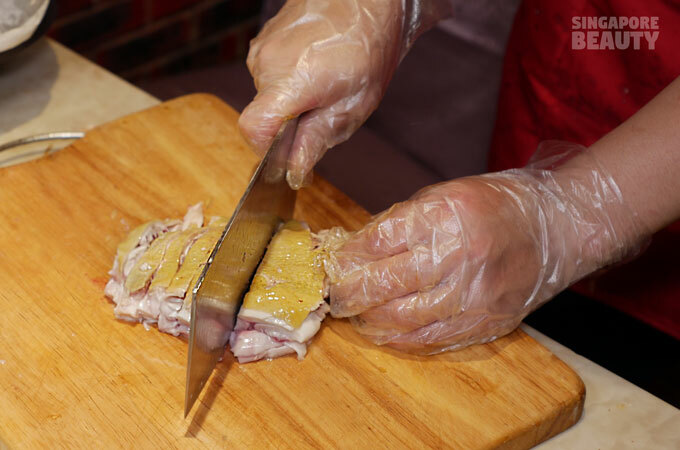 The last step is to glaze the skin with malt syrup before serving. The skin has a nice crisp to it. Oozing with savoury juices from the duck and the sweetness of malt syrup. A very interesting paring of sweet and savoury all within a slice of duck. Well flavoured tender flesh and with a subtle hint of spices. 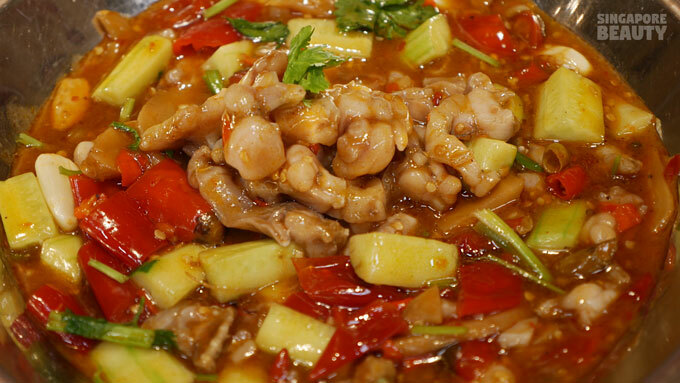 Braised frog leg with chilli – A delicacy of Chinese cuisine of frog legs braised in sweet and sour Sichuan sauce with chopped chilli pepper, ginger and garlic. Refreshing cucumber chunks and parsley are added to cool the palate. 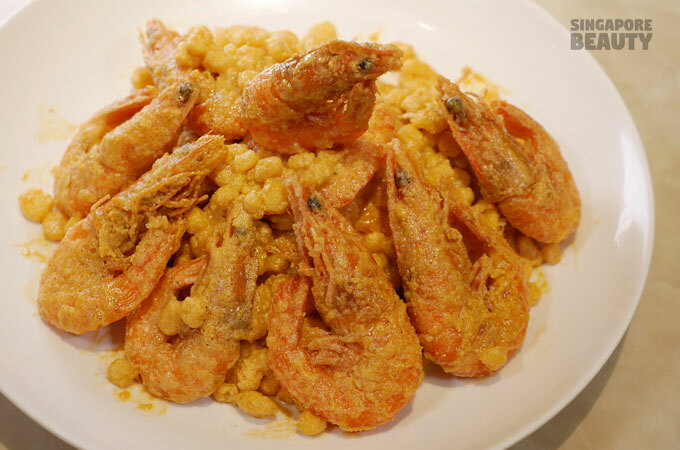 Shrimp with salted egg corn – Think Singaporean’s favourite Cereal prawn coated in salted egg yolk. 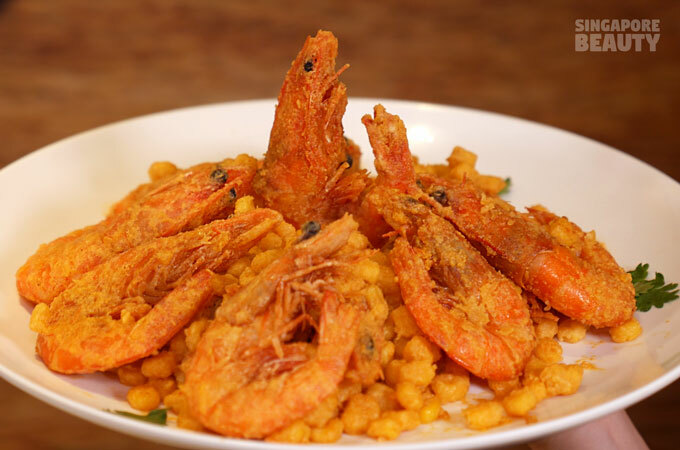 Creamy salted egg yolk with crunchy prawns and delightful bursts of sweet corn kernels. Recommended dish to try. 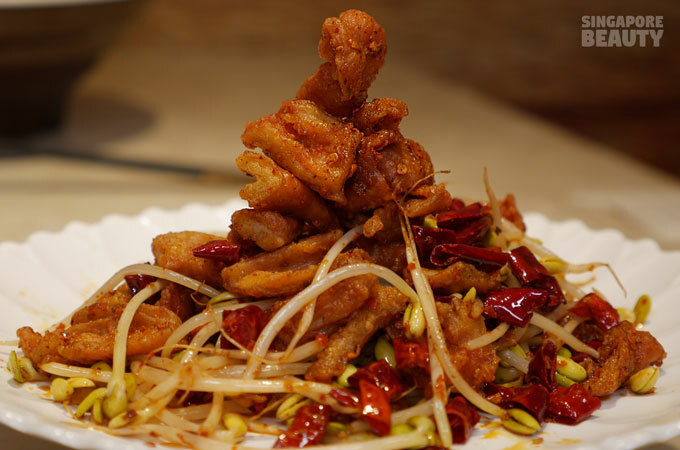 Fried pork intestines with chilli – Fried to a crisp with a chewy texture. Aroma of pungent spices and a numbing sensation to each bite. The more you chew, the more it teases the taste buds. Makes you salivate and is very addictive. Best dish to go with a bowl of steamed rice. 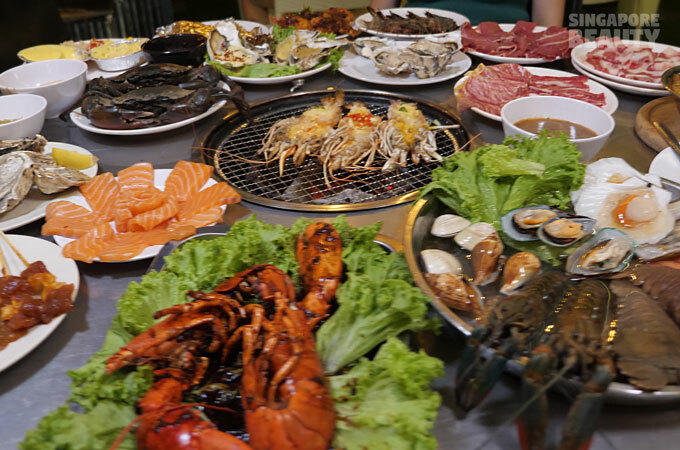 Enjoy your ala carte buffet in a cosy air conditioned restaurant that serves only authentic Sichuan food. 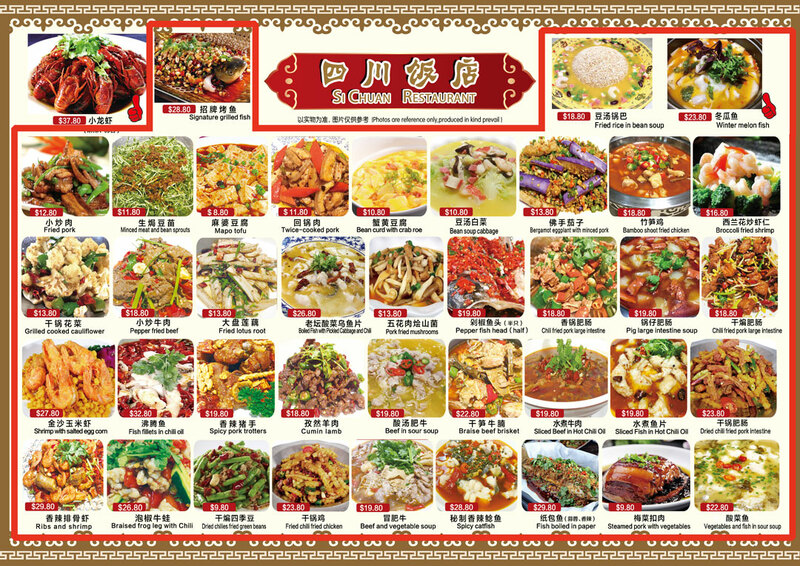 Feast of 80 Sichuan dishes to choose from. 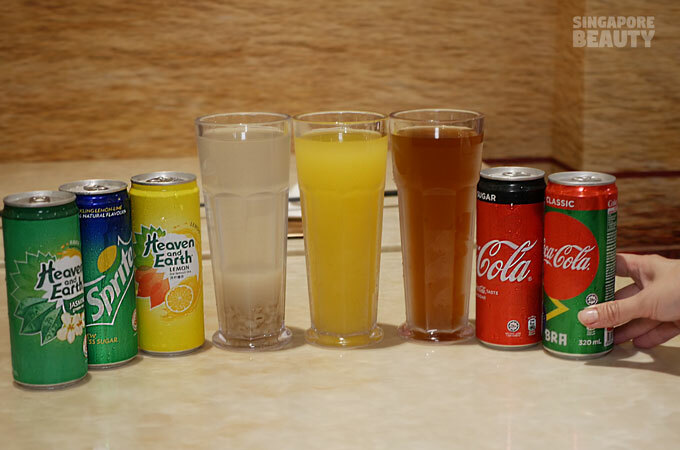 Seven flavours – sweet, sour, pungent, spicy, bitter, aromatic and briny – to tease your palate. 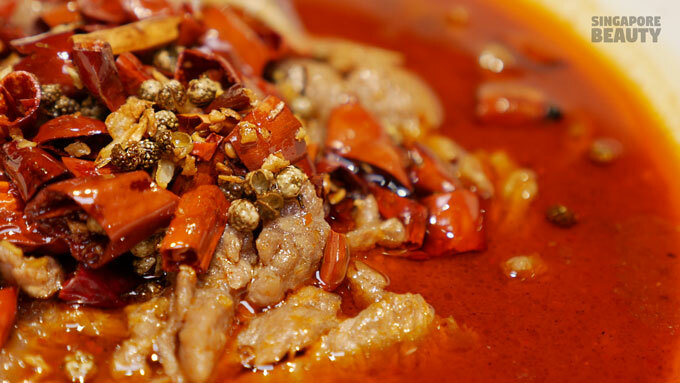 Make your reservations today for the authentic Sichuan food fiesta. The fastest finger gets the food. This ala carte buffet is available for a limited time only. 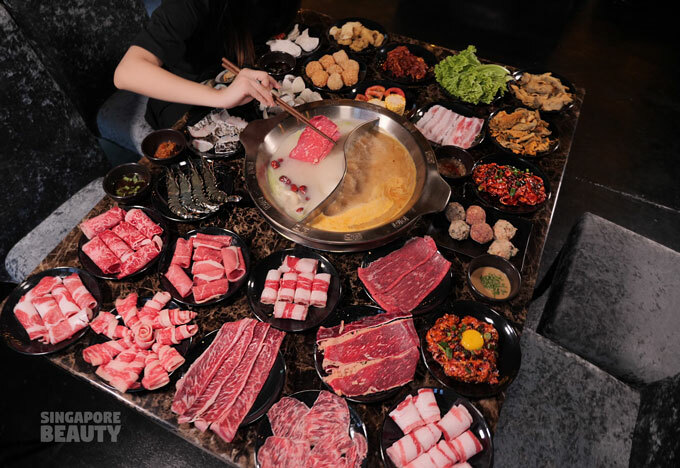 At this price, the amount of food choices and quality, this is one of the feast you need. Stop snoozing, book your tables today. The feast is waiting. 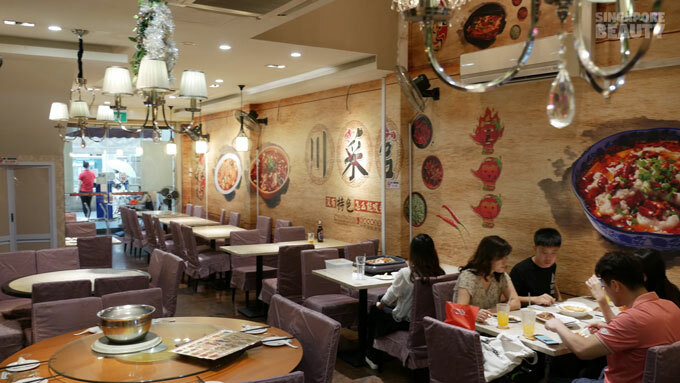 Sichuan Restaurant is a great place for big groups of 10 pax & more or smaller cosy groups of 4 or more. All the 80 dishes in the menu can only be ordered once and dine-in only. Baby lobsters/crawfish and crabs are excluded from this buffet. Food wastage will be charged $8/100grams. 1) Get seated only when everyone has arrived & order desired dishes from the 2 page menu. 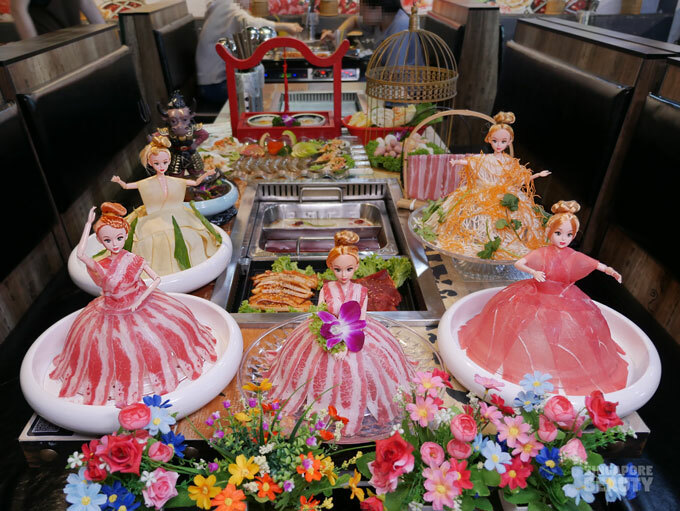 2) The chef will start preparing your food and will start serving dishes that are ready. 3) When the last dish is served, the *dine-in time of 1 hrs starts.